Built in the early 18th century these large masonry structures are striking to behold astronomical instruments, with a high degree of accuracy. 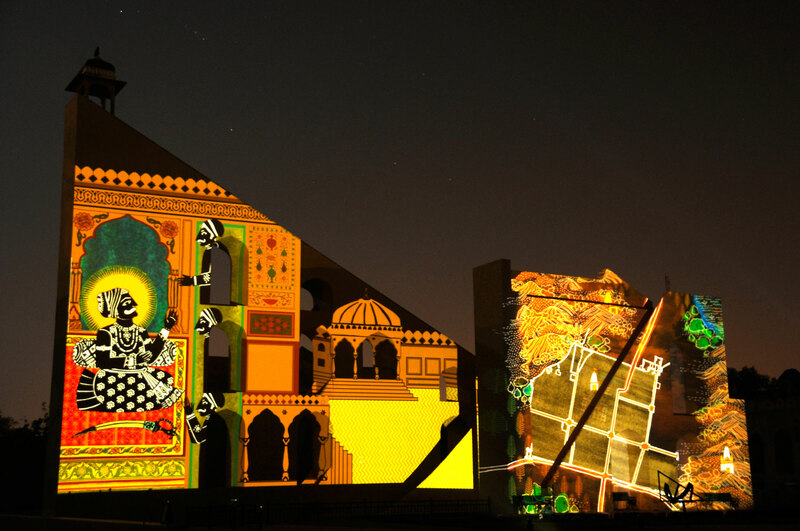 This sound & light show is a tribute to the ingenuity of Raja Sawai Jai Singh II, who engaged himself with such scientifically oriented adventures, even in politically turbulent times. The episodes narrate the making of Jantar Mantar and the need felt by Raja Jai Singh to shift the Kachwaha capital from Amber to the new capital city of Jaipur. The episodes also include stories about important astronomical instruments through graphical imagery, scintillating light effects and evocative music. A multi-lingual Digital Audio Guide is also available at this monument during the day, to understand the working of the various instruments in a leisured, private manner. The show is held within the precincts of Jantar Mantar. For the show, you may enter from the (day time) EXIT gate of the monument. If you are driving, enter Jaleb Chowk, from Amber Road, drive past City Palace and park the vehicle along the Jantar Mantar wall. It is advised that you reach at least fifteen minutes before the scheduled show time. The seating for the show is outdoors, please carry suitable warm cover, it tends to get cold during winter. You may request for mosquito repellent from the show usher. If using public transport, you may plan your return trip with a 60-75 minute waiting period. Flash photography, video and audio recording of the show is prohibited. Please avoid carrying such equipment. The show’s site is a protected heritage monument, please do not litter or try to enter prohibited areas. Wonderful show! Such a pleasure. Brilliant 50 minutes. We are going to remember this one. Its better than some of the international shows. Amazing show. I have no words to express. It’s the first experience of such a wonderful way of showing our virasat. Congratulations. Keep it up.